It can be a bit laborious to make this dessert completely from scratch, as homemade cajeta can take several hours, but thanks to a few store-bought ingredients, you can whip up the same fancy taste in your own kitchen in about 20 minutes from start to finish. I recently replaced my nearly 10-year-old nonstick cookware set with stainless steel because my nonstick pans were scratched, chipped and it was really time for them to go. At first, I was sad because my dad had given me that cookware set when I moved into my first apartment after grad school, so it felt like closing a chapter in my kitchen. Those pots and pans had been my cooking companions in four different kitchens over the years, and since the beginning of this blog, after all! However, after cooking with the new pots and pans just once, I was ready to toss the old set out with the trash. Pictured with this recipe, I’m using my new Calphalon Classic stainless steel cookware, made from durable, brushed stainless steel with impact-bonded aluminum bases for fast, even heating. They’re also dishwasher safe for easy clean-up. And if you’re making sticky, yummy desserts like this one, believe me, you want easy clean-up! Even heating is also particularly important in this recipe so as not to burn the crepes or the cajeta if your pans tend to have hot spots. The stay-cool stainless steel handles ensure you won’t get burned by hot handles on the stove (but you still need to use a potholder if you put them in the oven). I also love that these pans can be used on an induction pad, since I typically use one for an extra cooking space during the holidays, and they’re safe to use under the broiler and in the oven, too. One of the other perks of these pots and pans is that some of them have measuring marks, pouring spouts and straining lids so I can save myself from having to dirty any more dishes. I can’t wait to entertain for the holidays so I can really put my new cookware to use all at once. 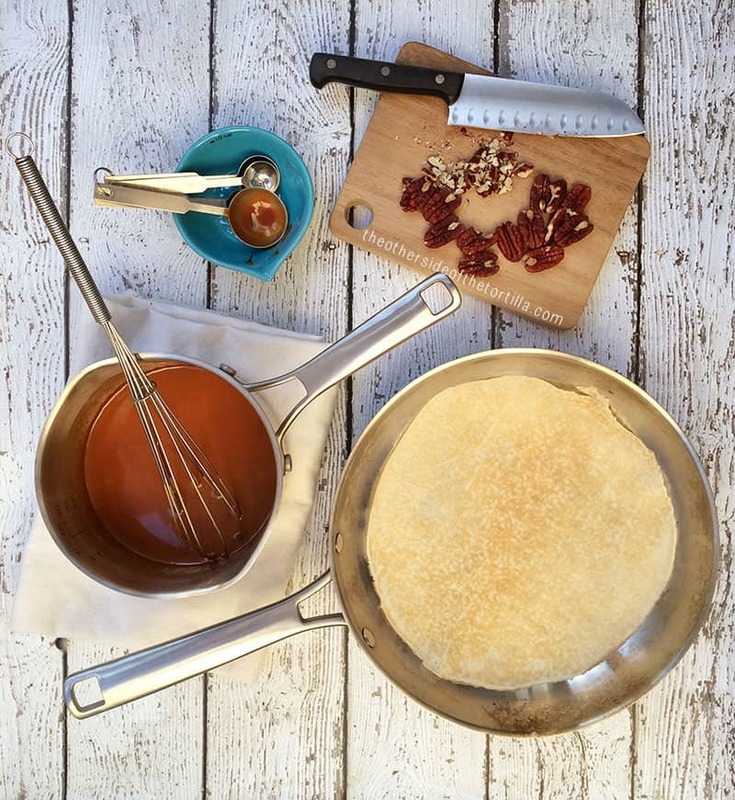 I might even have to host a pre-holiday party just to have some friends over to eat these crepas de cajeta! Shop my Calphalon Classic Stainless Steel set, available at Sears. 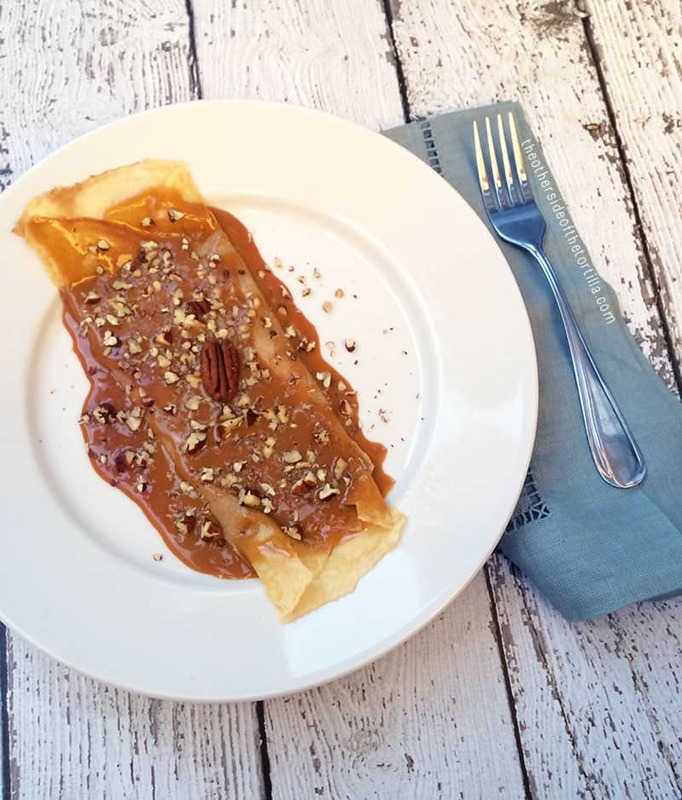 Crepas de cajeta con nueces, crepes with goat's milk caramel and pecans, is a popular dessert in Mexico influenced by French gastronomy due to the French occupation of Mexico in the 1860s. In a 10-inch pan over medium heat, toast pecans for about five minutes or until they start to change color slightly and smell roasted. Remove from heat and allow to cool. Roughly chop and set aside. In a saucepan over medium heat, add cajeta and heavy whipping cream and whisk together until the cream is completely incorporated. Bring to a boil and reduce to a simmer for 5 minutes. Remove from heat and set aside. In a 10-inch pan, melt a half-tablespoon of butter over medium-low heat and swirl the pan around to evenly coat with melted butter. Place crepe in the pan over butter to soften for about a minute on each side. After softening in the butter, move crepe to a plate, spoon cajeta in the middle and fold crepe edges toward the middle. Spoon more cajeta over the top of the crepe and garnish with chopped pecans.